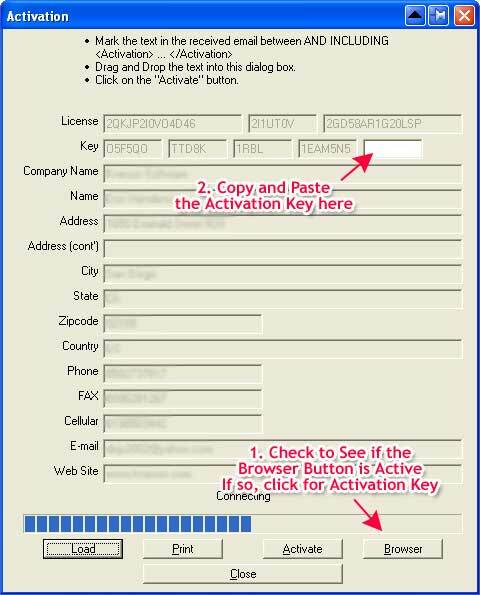 Did you follow the activation instructions on the Automatic License Activation page? Check again by clicking here. Did you have a live connection to the Internet at the time you tried to activate? NOTE: Kneson Software products do not require an Internet connection to operate them. A live Internet connection is only needed for a brief moment during automatic activation. If your computer never connects to the Internet then the procedure that follows will allow you to activate without ever having a connection to the Internet. If this is the case, skip to Step 1 below. Are you using Wordpad and not Notepad for dragging and dropping the license code? Notepad will not allow you to drag and drop. Wordpad will. 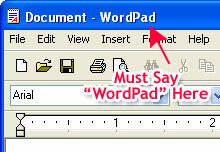 See Step 3 on this page (click here) for instructions on starting WordPad. When you try to automatically activate and get an error, is the Browser button clickable on the activation screen? If it is, click it and you will be taken to an Internet screen that gives you a code. Copy and paste this code into the activation screen yourself in the 5th key position (see diagram to the right). Then press Activate and you are done. Try to activate Imagener normally even without an Internet connection following the instructions on this page (click here). NOTE: This is for the purpose of getting all of your license information into the activation screen without you having to type it manually. You will receive an activation error. Click CLOSE. Hold down the SHIFT key and launch Imagener again. You will see a screen that allows you to type into the fields, and it should have all of your information filled in except the last KEY field. IF YOUR INFORMATION IS NOT FILLED IN: Find your license e-mail and enter the information manually - BE CAREFUL if you have to manually fill in information - one wrong character and we could go back and forth trying to get it right. It is much better to try to automatically activate several times to get the information into this screen automatically. Next, touch the Print Scrn button - that is the key on your keyboard located next to the Scroll Lock key. Make sure that the activation screen is visible when you touch the Print Scrn button. PLEASE DO NOT SEND US A JPG OR GIF FILE AS THESE ARE LOSSY FORMATS AND WE WILL NOT BE ABLE TO READ THE CODES IN THE ACTIVATION SCREEN. ONLY SEND US A WORD PROCESSING DOCUMENT WITH THE SCREEN SHOT INSIDE IT. PLEASE ONLY E-MAIL US FROM THE E-MAIL ADDRESS YOU USED WHEN YOU ORDERED! We will send you back the last KEY. Hold down the SHIFT key down, launch Imagener again, then enter the KEY and click ACTIVATE. IF AN ERROR OCCURS, READ ALL OF THESE INSTRUCTIONS AGAIN BEFORE CONTACTING US. If you are absolutely certain that you have read all instructions, and that you have made no errors in the above procedure, send us a message. MAKE SURE TO INCLUDE THE E-MAIL ADDRESS THAT YOU USED WHEN YOU ORDERED. Currency converter that allows you to convert multiple currencies in two keystrokes. Click here for more information. Accounting program for time. Use with your current day planner to put your plans into action! Click here for more information. Intercepts program crashes allowing you to unfreeze applications and save your work. Click here for more information. Kneson Software is so confident in the functionality and bulletproof stability of our products that we offer a 100%, no-questions-asked money back guarantee for a FULL 45 DAYS. If at any time you feel that our products do not EXCEED your expectations, we will refund you immediately.